Firstly I’d like to say thank you to all of you who still continued to pop by empfire while I was in Italy. I had very limited WiFi while I was there but I did manage to catch up with the world every now and then. I read all of your comments while I was on holiday, and I will get round to replying/returning comments over the next few days. I had a brilliant time in Italy! We stayed in the beach resort of Lido di Jesolo, just outside of Venice. The hotel was basic and the food wasn’t very vegetarian friendly (poor Tyrone). We ended up moving rooms on the first day because the one that they initially put us in was falling apart. Fortunately we got upgraded to a sea view for no extra cost (which would have been the case if we had booked a sea view online). The hotel was right on the beach so we spent most of our time there, building our tans. But of course, we couldn’t go to Jesolo and not make a trip to Venice. We booked an excursion with our travel operator. The excursion was Venice Day and Night, so we didn’t get picked up until 1pm and didn’t leave Venice until 10pm. It was short bus ride to the port where we caught a boat to Venice. 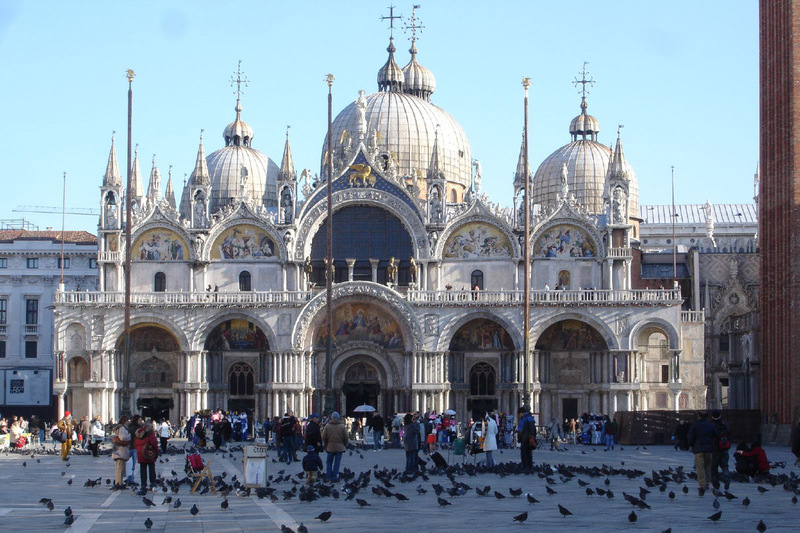 While in Venice we had a few tour of the main areas of the city, including a trip inside St Mark’s Basilica. Well, what can I say about Venice other than it’s probably the most amazing city in the world and that I didn’t want to leave. It’s just so beautiful. Everywhere you look is a perfect picture. My pictures really don’t do it justice. We were lucky that the weather was fantastic all day and night, which made a change as every other night it rained. We didn’t take a gondola ride, but I have no regrets. If we had gone on a gondola then we wouldn’t have had as much time as we did to explore on our own. Also, I want to return to Venice again in the future. The boat ride into Venice. One of the many leaning towers in Venice, caused by the city sinking. A much better quality photo courtesy of Tyrone. Featuring me and the Bridge of Sighs in the background. Taken during the evening. St Mark’s Square, where it’s impossible to get a decent picture without tourists in the way. No, this place isn’t wonky. I’m just a crap photographer. Haha! St Mark’s Campanile. Notice how St Mark’s Basilica (to the left) is covered in scaffolding. I couldn’t get a decent picture. 🙁 Here’s what is should look like. Selfie in St Mark’s Square. Isn’t this just the cutest, prettiest bridge you’ve ever seen?! When I went to Rome 2 years ago I had the best ice cream in the world. It was Nutella flavoured. I hadn’t had it since, so in Venice I was on a quest to find it and eat it again. I only found one place that sold it. It was heaven! The light in this square was perfect. Getting a picture of the Rialto Bridge is difficult because there is so much in the way! So I stole this one off Tyrone. And finally, I wanted to show you this picture. I could have cropped this photo to hide my crutch but hey, this is me and my disability. Without my crutch, and a hell of a lot of strong prescription painkillers, I wouldn’t have made it around Venice. Most of the time Tyrone held my crutch while he took pictures of me. And that concludes my stupidly long post on Venice. But pictures are easy to browse through so there wasn’t too much reading. For those who are interested in what I wore in Venice, the dress is from H&M (it’s the £7.99 dress I blogged about here), the sandals are from Dorothy Perkins and the sunglasses are Ray Bans (from their London Collection). I’m planning on doing a short post called “Lido di Jesolo in photographs” so stay tuned. That might be the biggest ice cream cone I’ve ever seen. I’ve never had Nutella flavored ice cream, but it does sound delicious. It was a pretty impressive size cone! Surprisingly it wasn’t too expensive either considering everything in Venice is overpriced. oh my goodness! Everything is so beautiful – including you! Your dress is so pretty on you! I’ve been to Italy, but we weren’t able to do Venice when we were there! Were you just there for one day? Ahh! Isn’t the gelato in Italy the best thing on earth??? I loved the Nutella, but I think my favorites were the raspberry and strawberry. They tasted just like the fruit – I think that’s what I miss most about Italy! Aww, thank you! I’m so glad I wore the dress because it was a hot day and the dress was really light to wear. Ice cream in Italy is the best! Even at the hotel they had the most amazing flavours. I actually did not go to Venice when I was backpacking–but it looks absolutely stunning and I’m regretting not going now. In any case, your photos look absolutely gorgeous! And I’m surprised there wasn’t Nutella flavoured gelato… I’ve found a lot of places in Europe have it! I’ve never seen Nutella ice cream other than in Italy. I think I will have to attempt to make my own if I want to have it in England. Wow! It looks absolutely beautiful. You both look like you a lovely time! The St Mark’s Square thing reminds me of when I went to London a coupkle of weeks ago and tried to take photos of Buckingham Palace. We didn’t realise it was the time for the guard changes so it was absolutely packed with tourists trying to watch what was going on. We couldn’t get anywhere near!! And that icecream sounds/looks amazing. I love Nutella. Yeah, Buckingham Palace was the same when I went. I’d love to see all of these places free from tourists, but that’s just impossible. Saying that though, it was a lot quieter in Venice at night. Venice looks beautiful! And wait, the city is sinking?!? Also, that nutella ice cream looks delicious. I can’t wait for the day that I can finally visit that city! Beautiful pictures by the way. But you’re right, I bet the city is even more beautiful in person. Yep. It’s sinking because a long time ago they built wells to draw water from the lagoon that Venice is situated in, and the process of drawing water is causing Venice to subside. The sinking also means that flooding is more common now so they are building flood barriers to reduce flooding. Oh my goodness that ice cream on that cone XD I’m so glad that you had an amazing time in Italy and especially Venice. It looks especially lovely. Maybe one day, I’ll go. That’s great that you guys got upgraded to a sea view! Venice looks beautiful, and this makes me really want to go there. I love the look of the buildings and how they’re right along the water. Everything looks so charming 😀 I’m also glad you got the dress you blogged about! You look great in it! It really is beautiful. And thank you. 🙂 I adore that dress and I can’t believe it was so cheap! Oh, it looks like such a pretty city! I really want to go there. I feel like after playing Assassins Creed 2 I’ve already been there when I look at the pictures, haha. But I really want to experience it for myself! I’ve heard that it is really easy to get lost there though, is that true? Ah, I really want to go to Italy and visit Venice and Rome (and other places if I can!) sometime. And nutella ice cream sounds like heaven. I had so many nutella crêpes in Paris I felt like I was having withdrawal from it when I got home. When we were walking through Venice Tyrone said it was just like Assassins Creed 2! I think it’s a lot small in the game but it’s really quite accurate. Our tour guide said one of the greatest things to do in Venice is to get lost. I’ve got a pretty good sense of direction but even I could get lost there! Nutella crêpes are the best! We always have them at the Christmas market in Liverpool. Ah, now I just want to go there even more. I loved that game, haha. I also have a good sense of direction but when everything looks pretty similar and all the streets are new and there are tall buildings everywhere it’s easy to get lost anywhere. I found some pretty places just walkig around like that in Paris! They don’t sell crêpes anywhere that I know of in Norway. So I enden up buying overpriced nutella (because Norway overprices everythig that is any good) and made some sweet pancakes and the drowned them in nutella. Yum!